I promised a few posts ago that I would tell y’all some of the stories that didn’t get documented during my pregnancy. Other than posting some random photos of my trip in this entry, I never did elaborate further on the beauties and wonders of our Vermont Vacation. So here ya go, the first installment of Things Left Unsaid: Vermont Edition. 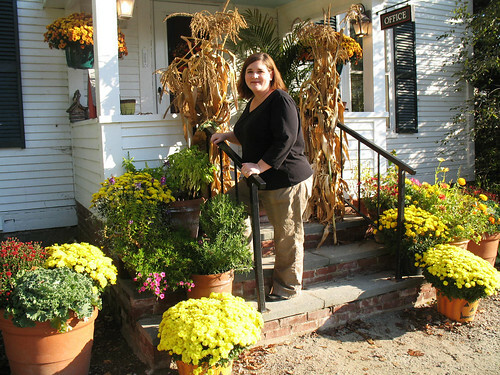 For many years I have had one thing that kept repeating over and over on my Life’s Big To-Do List: Visit New England in the Fall. Finally last year, when I was 6 months pregnant, I actually got to mark that accomplishment off of my list. 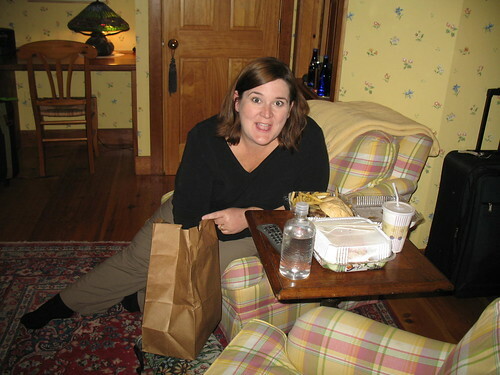 On October 2nd, 2007 my mom and I embarked on our once-in-a-lifetime leaf peeping adventure, flying to Hartford, Connecticut and driving through Massachusetts and into Vermont where we had reservations for the week. If you ever plan to visit Vermont in October, prepare in advance. Reservations are few and far between that time of year. We stayed in Weston for three nights, White River Junction for 1 night and Waitsfield in the Mad River Valley for 2 nights. 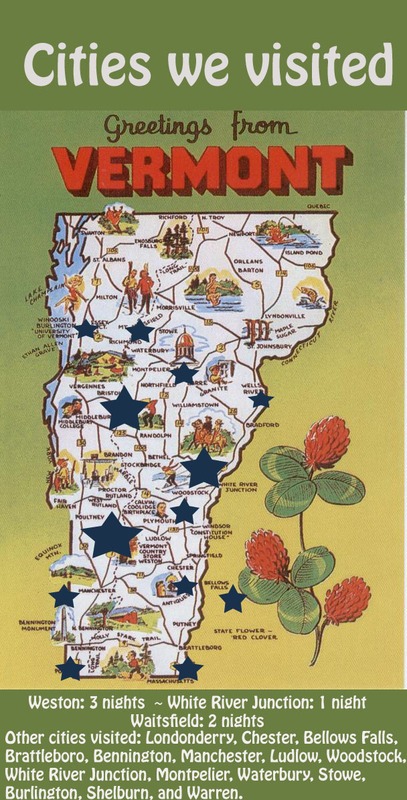 Vermont is not a very big place, so you can see by the stars on my little postcard here the main places that we hit up, which is basically the entire state. New England is absolutely amazing. Everything is quaint, even the size of the states themselves. All of them are tee-tiny. In the time it would take us Alabamians to drive from Montgomery to Huntsville we had already driven across three New England states. It was like, “Hey, look, we’re in Massachusetts!” Then about forty five minutes later…. “Hey, look, we’re in Vermont!” Back home on I-65 we would have just barely been chugging along past Peach Park. We decided to take back roads through Vermont (as if there were many other choices) to immerse ourselves in the culture. We took Route 100 and skirted along the edge of the Green Mountains, which to our dismay were just, well, too green. We were gung ho to see more fall colors, but unfortunately they hadn’t arrived just yet in Southern Vermont. But we still had seven days to go, and we were so giddy to be in New England that we didn’t let a little greenery get us down. Heck it was still 90 degrees when we left Birmingham, so anything was better than that. 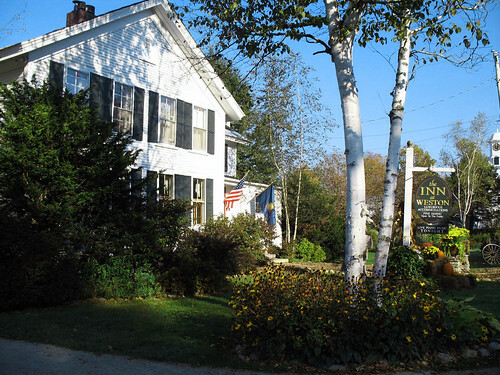 So on the afternoon of Day One, we arrived at our first destination, The Inn at Weston in Weston, Vermont. I immediately felt like I was stepping into an episode of Newhart as we crossed the state line. I was totally on the lookout for Larry, Darryl and his other brother Darryl. The whole state of Vermont is like one gigantic postcard. Everywhere you turn is another Kodak moment. 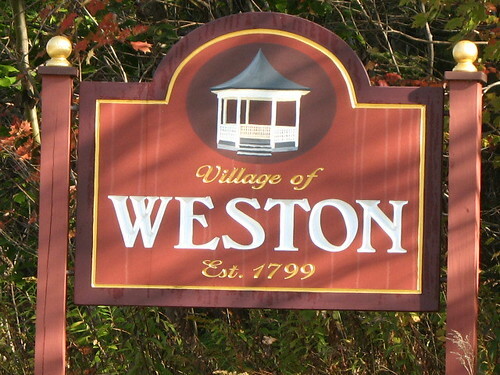 The entire town of Weston is in the National Registry of Historic Places. Not just a building here or there… the whole dang place! It was unbelieveable. Established in 1799 means they’ve had TWO HUNDRED and NINE years of history marinating in those buildings. That’s way old, by United States standards. And that is a LOT of buckets of barn red paint. 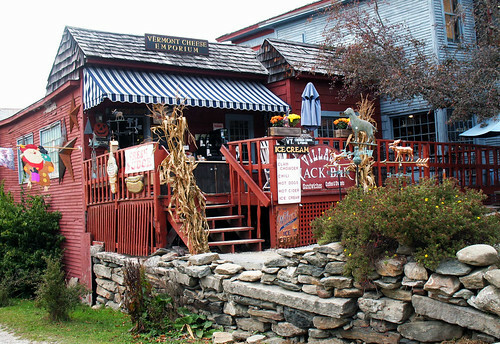 Weston is home to the Vermont Country Store, where I spent many hours sampling maple candy and a wide variety of room temperature cheeses on semi-stale crackers. 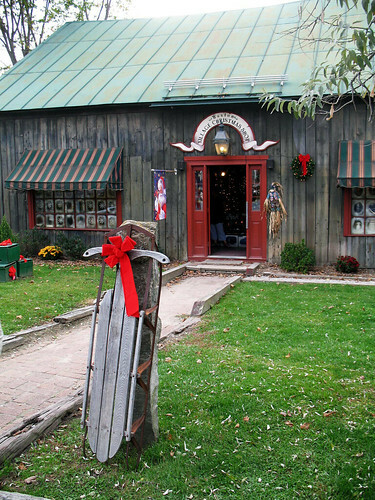 An entire emporium dedicated to cheese and fudge. Could it get any better? I think not. See the corn stalks all over the porches of these buildings? I kept noticing them twitching and moving as we walked by them. At first I thought it was the wind blowing them, but then realized it had to be something more than wind creating all that corn husk commotion. Finally curiosity got the best of me and I crept up on one all Crocodile Hunter style. And guess what jumped out? 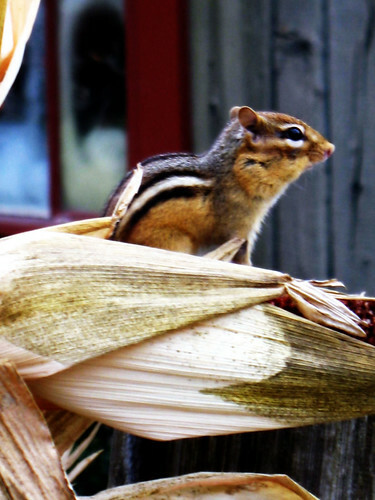 Chipmunks were scurrying all over the porches eating corn from the fall decorations. Pretty cute, eh? They were not very scared of people, so I got a good close encounter with Chip. 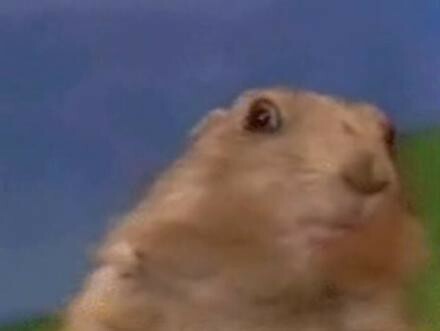 Or maybe it was Dramatic Chipmunk! I loved walking through all the shops and buying a few souveniers. I picked up some gorgeous leaf Christmas ornaments at the Village Christmas Shoppe. 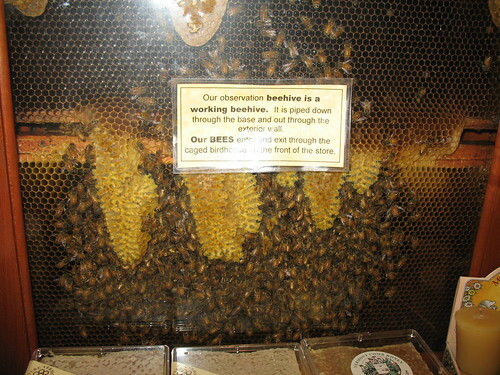 I was also quite enthralled by the Big Brother-esque bee hive that was happening in the walls of the Vermont Country Store. 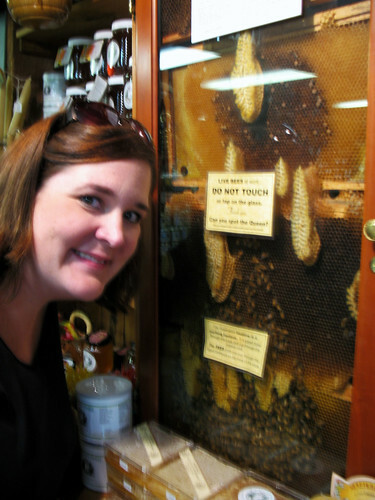 I am deathly afraid of bees, but these were behind glass so I felt safe to put my head just inches away from these suckers. Pretty amazing, huh? It was built right into the wall, so the bees fly out and gather pollen, then come back here for some honey-making reality shows at night. 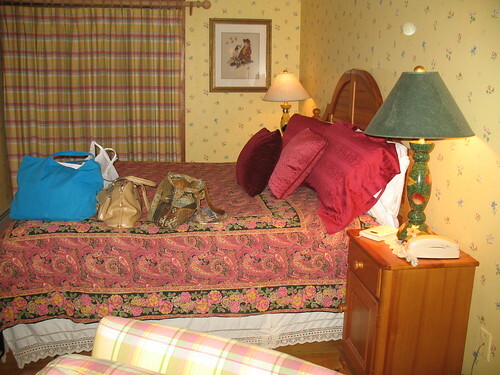 Our room at the Inn was in the Carriage House, which was separate from the main house of the Inn. 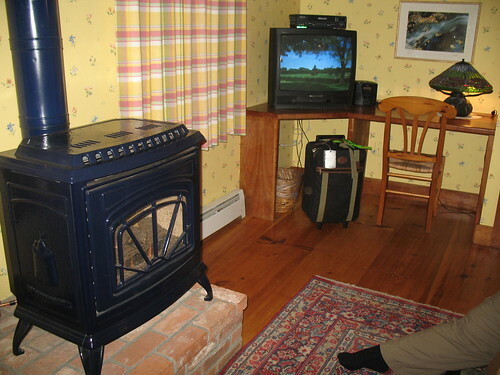 It was nice and cozy with a gas stove on a timer that could heat everything up in about two seconds flat. 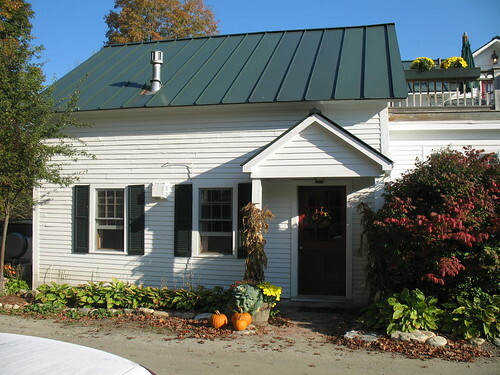 It was also a great place to sit and enjoy our first dinner in Vermont- a takeout cheeseburger from a tiny diner in Londonderry, a small town about ten miles away. Yes, we drove nearly twenty miles round trip for a cheeseburger, but you would too if you were 6 months pregnant and hadn’t eaten anything but cheese, fudge and maple candy all day long. 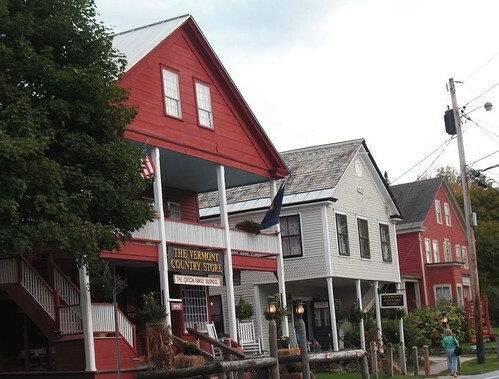 We soon learned that along with other modern day conveniences like cell phone service or private telephones in hotel rooms, fast food was not an option in these quaint Vermont villages. So we settled for slow food, or any food that we could scrounge up along the way even if it meant driving 20 miles to get it. You’ll notice there is a telephone on the nightstand. But please note that it only connected you to the front desk. It was essentially it was a line to nowhere after about 8 pm. 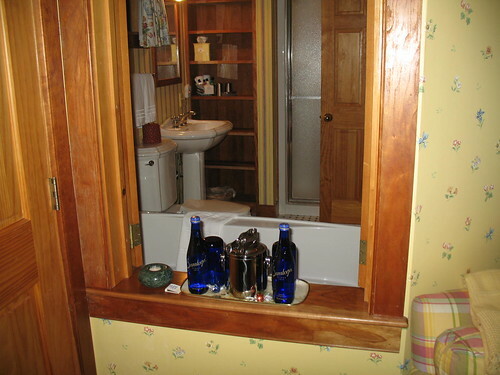 The bathroom was super nice with a little window so you could enjoy the fireplace while you soaked in a tub and lathered up with Patchouli scented soaps, no doubt handmade by a local soap artisan. Everything in Vermont seemed to be made by hand. Being 6 months pregnant and traveling many hours away from home, I was anxious to talk to my baby Daddy once we got settled into our room. This proved to be harder than it looked, however, without a reliable way to communicate with the outside world. But after a few hours of trying, I finally talked to my husband. We had four interruptions from the front desk during our twenty minute conversation, and I was beginning to feel like I was in Mayberry with Sara picking up on the party line. 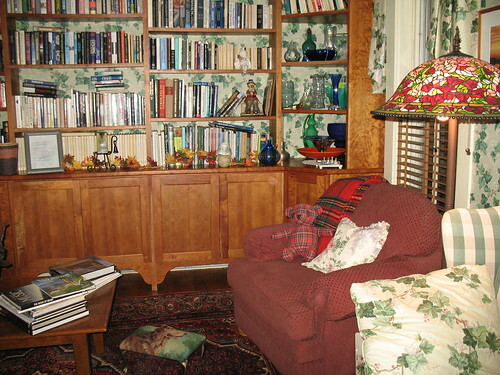 They did offer wireless internet service but it was only available in approximately six square inches of the library of the main house. 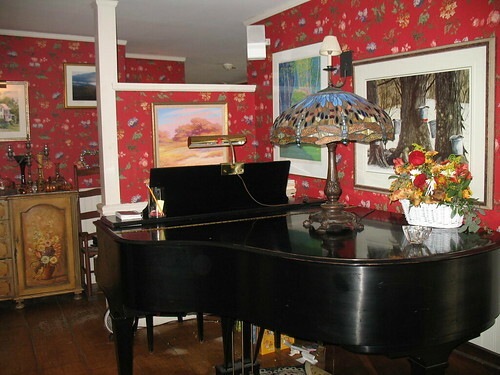 Once I finally discovered the Secrets of the LAN Whisperer in the library, I was able to settle into a comfy chair with my laptop and listen to the live piano music from the nearby dining room. I believe it was the most relaxed I’ve ever been while surfing the innernet. After a logging in for a while to check on the real world, catching up on the news and IM’ing my husband without Sara listening to our conversation, I headed off to bed to rest up for the week of excitement that was to follow. « In which I come out of the closet. Fudge and cheese? In one place? Sounds heavenly. My intestines would be confused. You should see some better color up towards Stowe area in the northern part of Vermont as my friend on the edge of the Northeast Kingdom said they are close to peak up there. Great pictures and I hope your trip continues to be enjoyable. Most of the New England states are small – until you get to Maine then you’ve not experienced wilderness until you experience it there. Weston is one of those pure New England communities — there aren’t a lot of them left with this type of authenticity and historical preservation. I think if I had to choose one picture-perfect New England town, this would be it. 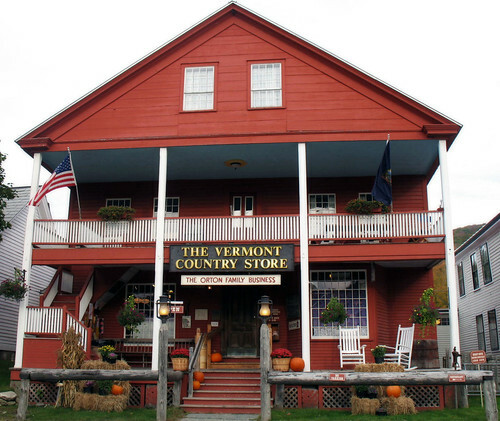 And yes, the fudge and cheese — and Vermont Country Store — certainly make things all that much better! Garrett’s Grandma felt him (the baby formerly known as Boudreaux) kick for the first time at the Inn at Weston. We set aside a moment (week) in time and made a memory to treasure forever. I think it was the slowness of everything, including us, that made it a soothing vacation. 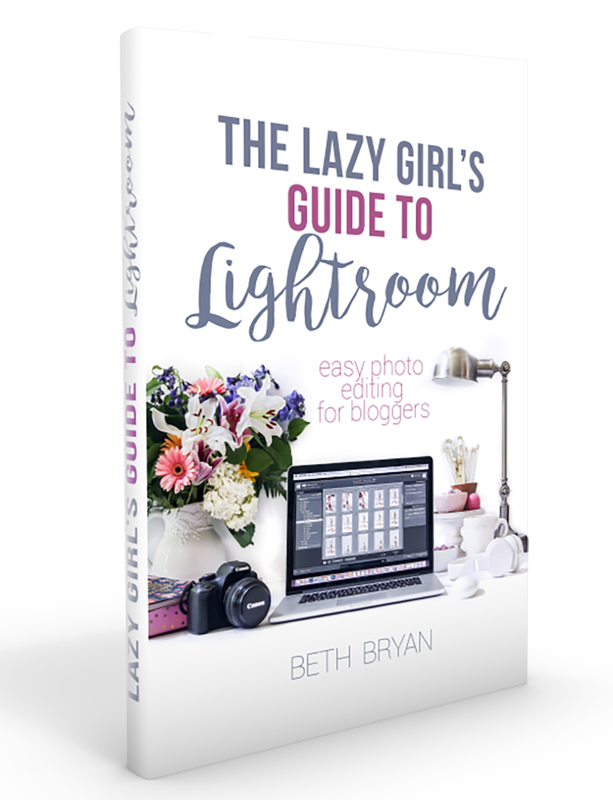 Can’t wait to read your next installment! 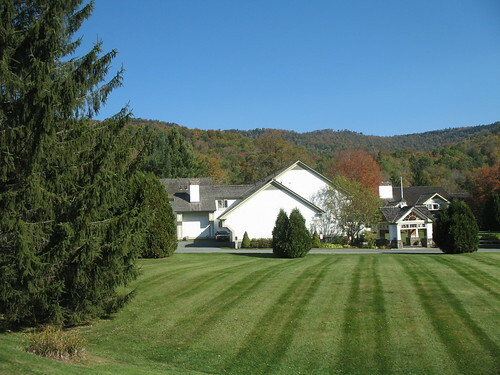 Looked at your Vermont trip from Centsational Girls link party. 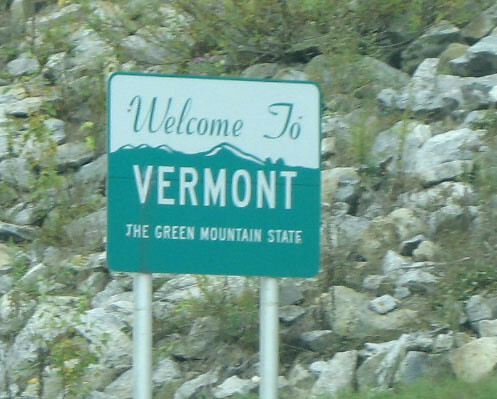 Having been to Vermont frequently, your pictures are such an accurate depiction of everything Vermont. Really nice pics. If you ever go back, be sure to check out the Northern Kingdom and Lake Willoughby. Definitely a summer trip though. Stunning space you got here! Gorgeous shots! Thanks for sharing such a lovely post.